Eating rare steak will not cause food poisoning if kitchen utensils used to cook it are kept clean, it is claimed. University of Nottingham scientists spiked steak samples with E.coli bacteria, then cooked them rare. The bacteria only survived where the steaks were touched by utensils that were not cleaned after being used to handle raw meat, researchers found. The study dispels the myth that eating rare steak is in itself unsafe, the Meat and Livestock Commission said. The tests, carried out on behalf of the commission, were designed to establish once and for all whether serving rare steak posed a health risk. To determine whether food poisoning bacteria could survive the cooking process, steak samples taken from separate fillets were spiked with E.coli. 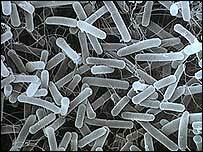 The bacteria, which are known to die at high temperatures, were still present in the samples even after cooking. But it was found that the cells' survival was caused by recontamination of the steaks during cooking, via the tongs used to turn them. Scientists then spiked more steaks and cooked them - but sterilised the tongs in ethanol between turns to ensure that the tongs could not recontaminate the meat. This time, no E.coli was detected. The study concluded that rare steak can be produced safely provided that food poisoning bacteria are not reintroduced by contaminated utensils. The Meat and Livestock Commission said there should no longer be any doubt over the safety of rare steak - a claim supported by advice issued by the Food Standards Agency. 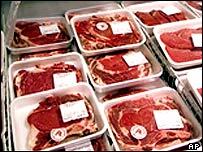 Its guidelines state that whole cuts of meat, such as steaks, cutlets and joints, are only ever contaminated by bacteria on the outside of the meat, which are destroyed during cooking even if the middle of the meat is pink, or rare. In the case of minced-meat products such as burgers and sausages, bacteria are spread throughout the product during manufacture. These products should be cooked until they are piping hot throughout, with no pink meat left and any juices running clear, it says. The agency also stresses the importance of keeping utensils clean while cooking any type of meat, to ensure that bacteria are not spread from raw to cooked foods. "The advice when cooking steak is to keep your utensils bacteria free"